The Commonwealth of Kentucky is a state located in the East Central United States of America. Kentucky is normally included in the group of Southern states, but it is sometimes included, geographically and culturally, in the Midwest. Kentucky is one of four U.S. states to be officially known as a commonwealth. Originally a part of Virginia, in 1792 it became the fifteenth state to join the Union. Kentucky is the 37th largest state in terms of land area, and ranks 26th in population. It is a land with diverse environments and abundant resources, including Mammoth Cave, the world's longest cave system; the Red River Gorge Geological Area with more than 100 natural stone arches. The gorge is the greatest concentration of arches east of the Rocky Mountains. Kentucky also has the greatest length of navigable waterways and streams in the continental 48 states. Kentucky features the two largest man-made lakes east of the Mississippi River and the nation's most productive coalfield. Both Abraham Lincoln and Jefferson Davis were born in log cabins on the Kentucky frontier, one year and a few miles apart. They were the presidents of the Union and the Confederacy respectively during the American Civil War. While Kentucky remained officially neutral in that conflict, many Kentuckians enlisted on both sides. Kentucky is known as the "Bluegrass State," a nickname based on the fact that bluegrass is present in many of the lawns and pastures throughout the state. 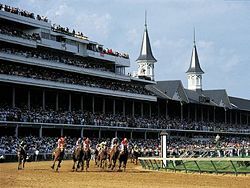 It is also is known for thoroughbred horses, horse racing, bourbon distilleries, bluegrass music, automobile manufacturing, gambling, and tobacco. Though bourbon may be produced anywhere in the United States where it is legal to distill spirits, it is estimated that 95 percent of the world's bourbon is distilled and aged in Kentucky. The origin of Kentucky's name (variously spelled Cane-tuck-ee, Cantucky, Kain-tuck-ee, and Kentuckee before its modern spelling was accepted) has never been definitively identified, though some theories have been debunked. For example, Kentucky's name does not come from the combination of "cane" and "turkey"; and though it is the most popular belief, it is unlikely to mean "dark and bloody ground," because it does not occur with that meaning in any known Native American language. The most likely etymology is that it comes from an Iroquoian word for "meadow" or "prairie" Other possibilities also exist: the suggestion of early Kentucky pioneer George Rogers Clark that the name means "the river of blood," a Wyandot name meaning "land of tomorrow," a Shawnee term possibly referring to the head of a river, or an Algonquian word for a river bottom. A typical view of rolling hills and horse farms in the Kentucky Bluegrass. Lake Cumberland is the largest artificial lake, in terms of volume, east of the Mississippi River. Located within the southeastern interior portion of North America, Kentucky has a climate that can best be described as humid subtropical. Monthly average temperatures in Kentucky range from a summer daytime high of 87°F (30.9°C) to a winter low of 23°F (-4.9°C). The average precipitation is 46 inches (116.84 cm) a year. Kentucky experiences all four seasons, usually with striking variations in the severity of summer and winter from year to year. Kentucky’s 90,000 miles of streams provide one of the most expansive and complex stream systems in the nation. Kentucky has both the largest artificial lake east of the Mississippi in water volume (Lake Cumberland) and surface area (Kentucky Lake). It is the only U.S. state to be bordered on three sides by rivers—the Mississippi River to the west, the Ohio River to the north, and the Big Sandy River and Tug Fork to the east. Its major internal rivers include the Kentucky River, Tennessee River, Cumberland River, Green River, and Licking River. Kentucky has an expansive park system which includes one national park, two National Recreation areas, two National Historic Parks, two national forests, 45 state parks, 37,696 acres (153 km²) of state forest, and 82 Wildlife Management Areas. Cumberland Falls State Park, one of the few places in the Western Hemisphere where a "moon-bow" may be regularly seen. Mammoth Cave National Park, featuring the world's longest cave system. Daniel Boone Escorting Settlers through the Cumberland Gap (George Caleb Bingham, oil on canvas, 1851–1852). Although inhabited by Native Americans in prehistoric times, when explorers and settlers began entering Kentucky in the mid-1700s, there were no major Native American settlements in the region. Instead, the country was used as hunting grounds by Shawnee from the north and Cherokee from the south, who lived in scattered seasonal villages. Much of what is now Kentucky was purchased from Native Americans in the treaties of Fort Stanwix (1768) and Sycamore Shoals (1775). Thereafter, Kentucky grew rapidly as the first settlements west of the Appalachian Mountains were founded, with settlers (primarily from Virginia, North Carolina, Maryland, Delaware, and Pennsylvania) entering the region either over land via Braddock Road and the Cumberland Gap, or by water down the Ohio River from points upstream, or up the Ohio River from the Mississippi. The first part to be settled was the north, along the Ohio River, with Lexington and Washington being the first major settlements. Next, the southern part of the state was settled, via the Wilderness Trail across the Cumberland Gap, blazed by Daniel Boone, traditionally considered one of the founders of the state. Shawnee north of the Ohio River were unhappy about the settlement of Kentucky, however, and allied themselves with the British in the American Revolutionary War (1775–1783). Kentucky was a battleground during the war; the Battle of Blue Licks, one of the last major battles of the Revolution, was fought in Kentucky. Kentucky was a border state during the American Civil War. It officially remained "neutral" throughout the war due to the Union sympathies of many of the Commonwealth's citizens. After the war, the development of burley tobacco contributed to a tremendous increase in tobacco production. During World War II, Kentucky began to shift from an agricultural to an industrial economy, but it was not until 1970 that the number of urban dwellers outpaced rural dwellers. Tourism has developed into a major industry. 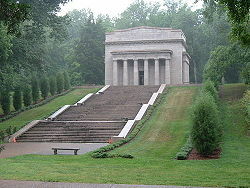 The Abraham Lincoln Birthplace National Historical Site in Hodgenville. The early 19th-century cabin is enclosed within this neo-classic building. 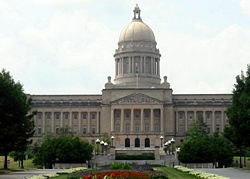 Frankfort is the capital city of Kentucky and the county seat of Franklin County. The population was 27,741 at the 2000 census; by population, it is the 5th smallest state capital city in the United States. After Kentucky became a state, five commissioners were appointed on June 20, 1792, to choose a location for the state capital. The Kentucky General Assembly appropriated funds to provide a house to accommodate the governor in 1796. Construction was completed in 1798. The Old Governor's Mansion is reputed to be the oldest official executive residence still in use in the United States. Kentucky is a commonwealth, meaning its government is run according to the common consent of its people. It is one out of only four states that call themselves commonwealths. Kentucky is also one of only five states that elects its state officials in odd numbered years (the others are Louisiana, Mississippi, New Jersey, and Virginia). Kentucky holds elections for these offices every four years in the years preceding presidential election years. Kentucky's legislative branch consists of a bicameral body known as the Kentucky General Assembly. The Senate is considered the upper house. It has 38 members and is led by the President of the Senate. The House of Representatives has 100 members and is led by the Speaker of the House. The executive branch is headed by the governor and lieutenant governor. The governor and lieutenant governor usually run on a single ticket and are elected to four-year terms. Currently, the governor and lieutenant governor are Democrats Steve Beshear and Daniel Mongiardo. The judicial branch of Kentucky is made up of courts of limited jurisdiction called District Courts; courts of general jurisdiction called Circuit Courts; an intermediate appellate court, the Kentucky Court of Appeals; and a court of last resort, the Kentucky Supreme Court. Unlike federal judges, who are usually appointed, justices serving on Kentucky state courts are chosen by the state's populace in non-partisan elections. The state's chief prosecutor, law enforcement officer, and law officer is the attorney general. The attorney general is elected to a four-year term and may serve two consecutive terms under the current Kentucky Constitution. The current Kentucky attorney general is Democrat Jack Conway. Where politics are concerned, Kentucky historically has been very hard fought and leaned slightly toward the Democratic Party, although it was never included among the "Solid South." In 2006, 57.05 percent of the state's voters were officially registered as Democrats, 36.55 percent registered Republican, and 6.39 percent registered with some other political party. Kentucky has voted Republican in five of the last seven presidential elections but has supported the Democratic candidates of the South. The Commonwealth supported Democrats Jimmy Carter in 1976 and Bill Clinton in 1992 and 1996 but Republican George W. Bush in 2000 and 2004. Bush won the state's 8 electoral votes overwhelmingly in 2004 by a margin of 20 percentage points and 59.6 percent of the vote. Prior to the adoption of the state constitution in 1891, the General Assembly had the authority to grant charters to private organizations allowing them to conduct lotteries in order to fund public works such as roads and schools. Due to a considerable amount of abuse, a prohibition on lotteries was written into the 1891 constitution (Section 226). An exception in gaming case law was the legality of pari-mutuel wagering on horse racing. In 2008, legal forms of gambling in the state included commercial, legalized gambling in horse racing, lottery sales (approved in 1988), and charitable gaming. In January 2008, electronic machine, or casino-style gambling had still not been approved by the General Assembly, and while prospects for approval seemed high, there were many opponents. In September 2008, a Franklin County Circuit judge ordered the transfer of the domain names of 141 illegal Internet gambling sites to the Commonwealth of Kentucky in an effort to stop illegal and unregulated online gaming. Kentucky is the first state to bring an action against Internet gambling operators that has resulted in the seizure of domain names. Population growth is centered along and between interstates I-65 and I-75. 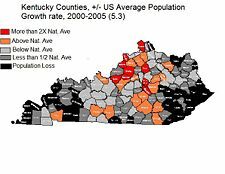 As of July 1, 2006, Kentucky had an estimated population of 4,206,074, which is an increase of 33,466, or 0.8 percent, from the prior year and an increase of 164,586, or 4.1 percent, since 2000. This includes a natural increase since the last census of 77,156 people (that is 287,222 births minus 210,066 deaths) and an increase due to net migration of 59,604 people into the state. Immigration from outside the United States resulted in a net increase of 27,435 people, and migration within the country produced a net increase of 32,169 people. As of 2004, Kentucky's population included about 95,000 foreign-born (2.3 percent). Kentucky's total population has grown during every decade since records began. However during most decades of the twentieth century there was also net out-migration from Kentucky. Since 1900, rural Kentucky counties have experienced a net loss of over one million people from migration, while urban areas have experienced a slight net gain. The Greater Louisville Metro Area holds a very disproportionate share of Kentucky's population, growth, and wealth. The second largest city is Lexington. The metropolitan areas of Louisville, Lexington, and northern Kentucky had a combined population of 2,169,394 as of 2006, which is 51.5 percent of the state's total population. 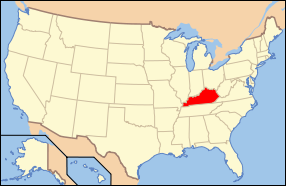 The two other fast-growing urban areas in Kentucky are the Bowling Green area and the "Tri-Cities Region" of southeastern Kentucky, comprising the towns of Somerset, London, and Corbin. The five largest ancestries in the commonwealth are: American (20.9 percent) (Mostly of British ancestry), German (12.7 percent), Irish (10.5 percent), English (9.7 percent), African American (7.8 percent). Only eight Kentucky counties list an ancestry other than "American" as the county's largest, those being Christian and Fulton, where African-American is the largest reported ancestry, and the state's most urban counties of Jefferson, Oldham, Fayette, Boone, Kenton, and Campbell, where German is the largest reported ancestry. Southeastern Kentucky was populated by a large group of Native Americans of mixed heritage, also known as Melungons, in the early nineteenth century. African-Americans, who made up one-fourth of Kentucky's population prior to the Civil War, declined in number as many moved to the industrial North in the Great Migration. Today 44.2 percent of Kentucky's African-American population is in Jefferson County and 52 percent are in the Louisville Metro Area. Other areas with high concentrations, besides Christian and Fulton Counties, are the city of Paducah, the Bluegrass, and the city of Lexington. Many mining communities in far southeastern Kentucky also have populations that are between 5 and 10 percent African-American. Religious movements were important in the early history of Kentucky. Perhaps the most famous event was the interdenominational revival in August 1801 at the Cane Ridge Meeting house in Bourbon County. As part of what is now known as the "Western Revival," thousands began meeting around a Presbyterian communion service on August 6, 1801, and ended six days later on August 12, 1801 when both humans and horses ran out of food. Some claim that the Cane Ridge revival was propagated from an earlier camp meeting at Red River Meeting House in Logan County. 46.57 percent were not affiliated with any church. Kentucky's agricultural outputs are horses, cattle, tobacco, dairy products, hogs, soybeans, and corn. Its industrial outputs are transportation equipment, chemical products, electric equipment, machinery, food processing, tobacco products, coal, and tourism. The eastern Kentucky coal fields are recognized as being among the most productive in the nation. Kentucky ranks 4th among U.S. states in the number of automobiles and trucks assembled. The Chevrolet Corvette, Cadillac XLR, Ford Explorer, Ford Super Duty trucks, Toyota Camry, Toyota Avalon, and Toyota Solara are assembled in Kentucky. Oak casks used to store and age bourbon at Kentucky's Buffalo Trace Distillery. Unlike many bordering states, which developed a widespread industrial economy, much of rural Kentucky has maintained a farm-based economy, with cattle, corn, and soybeans being the main crops. The area immediately outside Lexington is also the leading region for breeding thoroughbred racing horses, due to the high calcium content in the soil. Despite being the 14th smallest state in terms of land area, Kentucky still ranks 5th in the total number of farms, with more farms per square mile than any other U.S. state. The average farm size in Kentucky is only 153 acres (0.6 km²). Kentucky ranks 5th nationally in goat farming, 8th in beef [[cattle] production, and 14th in corn production. Since 2003, high-end bourbons (aged more than six years) have seen revenue grow from $450 million to over $500 million, some 2.2 million cases, in the United States. High-end bourbon sales accounted for 8 percent of total spirits growth in 2006. In 2007, United States spirits exports, virtually all of which are American whiskey, exceeded $1 billion for the first time. This represents a 15 percent increase over 2006. American whiskey is now sold in more than 100 different countries. The leading markets are the United Kingdom, Canada, Germany, Australia, and Japan. Key emerging markets for American whiskey are China, Vietnam, Brazil, Chile, Romania, and Bulgaria. More than 95 percent of the world’s Bourbon is distilled and aged in Kentucky. Louisville, from 1927 to 2004, was home to Brown & Williamson, the third largest company in the tobacco industry before merging with R. J. Reynolds in 2004 to form the Reynolds American Company. Brown & Williamson, one of the subjects of the tobacco industry scandals of the 1990s, was the focus of The Insider, a 1999 film shot around the Louisville area. The end of the federal tobacco program in 2004, and the government-guaranteed prices that went with it, have forced many Kentucky growers to attempt various farming alternatives. Burley (cigarette tobacco) production was expected to total 144.9 million pounds on 69,000 acres in 2008, down from 470.4 million pounds on 240,000 acres in 1997. A growing number of cities and counties are passing restrictions on smoking, even in the heart of Kentucky's tobacco-growing region. The Kentucky Derby. Image courtesy of Kentucky Dept. of Travel. Although Kentucky's culture is generally considered to be southern, it is unique and also influenced by the Midwest and southern Appalachia. Kentucky was a slave state, and African-Americans once comprised over one-quarter of its population. However, it lacked the cotton plantation system and never had the same high percentage of African-Americans as most other slave states. Kentucky adopted the Jim Crow system of racial segregation in most public spheres after the Civil War, but the state never disenfranchised African-American citizens to the level of the Deep South states, and it peacefully integrated its schools after the 1954 Brown v. Board of Education verdict, later adopting the first state civil rights act in the South in 1966. Louisville is home to a number of annual cultural events. Perhaps most well-known is the Kentucky Derby, held annually during the first Saturday of May. The Derby is preceded by a two-week long Kentucky Derby Festival, which starts with the annual Thunder Over Louisville, the largest annual fireworks display in the nation. The Kentucky Derby Festival also features notable events such as the Pegasus Parade, The Great Steamboat Race, Great Balloon Race, a marathon, and about 70 events in total. Esquire magazine has called the Kentucky Derby "the biggest party in the south." ↑ Population and Housing Unit Estimates. U.S. Census Bureau (December 20, 2017). Retrieved December 20, 2017. ↑ Online Etymology Dictionary. Kentucky Retrieved September 25, 2008. ↑ Mapquest. Map of Ohio River in Evansville, IN Retrieved September 25, 2008. ↑ NetState.com. The Geography of Kentucky - Climate Retrieved September 26, 2008. ↑ Corbin, Kentucky Economic Development. A Fisherman's Paradise Retrieved September 26, 2008. ↑ Mercer County Online. The Presence History of Native Americans in Central Kentucky. Retrieved September 26, 2008. ↑ Constance Skinner. The Dark and Bloody Hunting Ground Pioneers of the Old Southwest. Retrieved September 26, 2008. ↑ Danville-Boyle County Convention & Visitors Bureau. Constitution Square State Historic Site Retrieved September 26, 2008. ↑ Kentucky Secretary of State. 2006. 2006 General Election Registration Figures Set Retrieved September 26, 2008. ↑ CNN. Election Results for Kentucky Retrieved September 26, 2008. ↑ Cornell University Law School. McCreary County v. ACLU of Kentucky Retrieved September 26, 2008. ↑ United States Court of Appeals for the Sixth Circuit. Text of decision in ACLU of Kentucky v. Mercer County, No. 03-5142 Retrieved September 26, 2008. ↑ Barry Boardman, Jack Jones, John Perry, and Murray Wood. November 2003. Compulsive Gambling in Kentucky Legislative Research Commission. Retrieved October 23, 2008. ↑ Brett Guthrie. January 10, 2008. Sensing an air of inevitability on casino gambling KYPolitics.org. Retrieved October 23, 2008. ↑ Commonwealth of Kentucky. September 22, 2008. Governor Steve Beshear's Communications Office Retrieved October 23, 2008. ↑ Association of Religion Data Archives. 2000. State Membership Report Retrieved September 26, 2008. ↑ Kentucky Cabinet for Economic Development. Kentucky Economy Retrieved September 26, 2008. ↑ U.S. Department of Agriculture. 2002. Farms, Land in Farms, Value of Land and Buildings, and Land Use: 2002 and 1997 Retrieved September 26, 2008. ↑ Kentucky Bourbon Trail. Sampler Tour Retrieved October 22, 2008. U.S. Energy Information Administration. Kentucky State Energy Profiles Retrieved September 23, 2008. U.S. Geological Survey. Science In Your Backyard: Kentucky Retrieved September 23, 2008. Jewell, Malcolm E. and Everett W. Cunningham. Kentucky Politics. Univ. of Kentucky Press, 1968. Miller, Penny M. Kentucky Politics & Government: Do We Stand United? (1994) Questia. Retrieved September 23, 2008. Bodley, Temple and Samuel M. Wilson. History of Kentucky. 4 vols. 1928. Channing, Steven. Kentucky: A Bicentennial History. W. W. Norton and American association for State and Local History. 1977. Collins, Lewis. History of Kentucky. (1880). Klotter, James C. Our Kentucky: A Study of the Bluegrass State. 2000, high school text. Lucas, Marion Brunson and Wright, George C. A History of Blacks in Kentucky. 2 vols. (1992). Vol. 1: From Slavery to Segregation, 1760-1891, 2nd ed. Kentudky Historical Society, 2003. ISBN 0916968324. A History of Blacks in Kentucky: In Pursuit of Equality, 1890-1980. 1992. ISBN 0916968219. University of Kentucky. Notable Kentucky African Americans Retrieved September 23, 2008. Ward, William S. A Literary History of Kentucky. 1988. ISBN 087049578X. Federal Writers' Project of the Work Projects Administration for the State of Kentucky. WPA, Kentucky: A Guide to the Bluegrass State (1939) Retrieved September 23, 2008. Bakeless, John. Daniel Boone, Master of the Wilderness (1989) Questia. Retrieved September 23, 2008. Blakey, George T. Hard Times and New Deal in Kentucky, 1929–1939. 1986. Fenton, John H. Politics in the Border States: A Study of the Patterns of Political Organization, and Political Change, Common to the Border States: Maryland, West Virginia, Kentucky, and Missouri (1957) Questia. Retrieved September 23, 2008. Klotter, James C. Kentucky: Portrait in Paradox, 1900–1950. (1992) Kentucky Historical Society, 2001. Sonne, Niels Henry. Liberal Kentucky, 1780–1828 (1939) Questia. Retrieved September 23, 2008. Townsend, William H. Lincoln and the Bluegrass: Slavery and Civil War in Kentucky (1955) Questia. Retrieved September 23, 2008. Waldrep, Christopher Night Riders: Defending Community in the Black Patch, 1890–1915 (1993) Questia. Retrieved September 23, 2008. Louisville is the state's largest city, with a metro population of 1.2 million. Lexington is the state's second largest city, with a metro population of around 500,000. Although Covington, Kentucky only has a population of 42,000, the Kentucky side of the Cincinnati/Northern Kentucky metropolitan area has a population of over 450,000. The world famous Louisville Slugger baseball bat is made in Kentucky. The largest river in North America, the Mississippi converges with the Ohio River along the Kentucky border near Wickliffe. This page was last modified on 1 November 2018, at 14:58.